Tech News India: G-Fone G-588 India’s first mobile phone with CDMA + GSM OR GSM + GSM SIM. G-Fone G-588 India’s first mobile phone with CDMA + GSM OR GSM + GSM SIM. Another very smart QWERTY mobile phone has just arrived a very new and stylish mobile phone has exclusive features. G-Fone G-588 India's first mobile with all the features like CDMA GSM OR GSM GSM SIM card options. So many attractive features to mesmerise you. This mobile was launched by Bright Telecom India Pvt. Ltd with pice Rs. 4,799. Dimensions of 112 x 62.5 x 12.2 mm and phone weights 105 Grams. 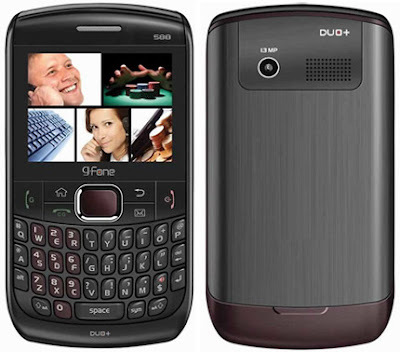 New G-Fone G-588 will really caters your all necessaries like social networking, with an exclusive Nimbuzz – Free international mobile call chat messaging with skype pre-installed, it has yahoo messenger, MSN and Icq messenger. New G-Fone G-588 is gifted with MTK6225 QSC6010 Chipset with 104 MHz CPU and has 2.2 inch QVGA display supported by 1.3 MP camera that can be used as PC camera also. Smart . expandable memory up to 8GB, English and Hindi language support, Blue tooth and FM radio to make so many entries it has 1000 entries phonebook. Amazingly it has e book reader with Currency converter along with MP3 background, other features are playback and call record . Strong support of 1050mAh battery with 240hrs standby and 240minutes of talk time .New G-Fone G-588 has really got some exclusive features to catch your hold at really!